New Ford Motor Co. CEO Jim Hackett has an axe, but Ford of Canada holds the Edge. And that utility vehicle — built at the Oakville, Ont., plant, which is Ford’s largest facility in Canada — should help the Canadian subsidiary weather the automaker’s latest round of cuts and consolidation. 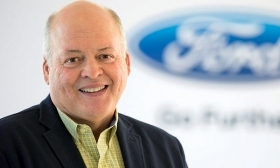 Utility vehicles and trucks are key to Hackett’s plan to focus on Ford’s biggest sellers and slash costs as the company moves more emphatically into electric and connected vehicles. This means the demise of some car models, but not the Edge or any successor on Ford’s backbone CD4 platform that could slip into the Oakville plant. The strategy also offers some reassurance for employees at two Windsor, Ont., plants that build V-8 and V-10 engines, mainly for trucks, and at a new Ottawa research centre working on connected vehicles. “I haven’t seen anything in particular that you can say, ‘That’s good news for Canada, that’s bad news for Canada,’” said Tony Faria, co-director of the Office of Automotive and Vehicle Research at the University of Windsor. Hackett, the former Steelcase boss who became Ford’s top executive in May, replacing Mark Fields, has revealed plans to streamline model offerings, trim $14 billion in materials and engineering costs, and reroute one third of engine deployment costs to electric and hybrid vehicles. Many saw the announcement, made before a group of New York investors in October, as a bid to boost share prices that Ford believes are undervalued by a market enamoured with advanced technology. But for Canadian employees already nervous over the potential crumbling of the North American Free Trade Agreement, Hackett’s comments spurred new fears. Ford agreed in 2016 contract talks to build a new engine, reportedly a 6.9 or 7.0-litre V-8 for Super Duty pickups, at its Windsor engine plants. Ford has since announced investments totalling $1.2 billion for the engine refit and other Ontario projects, including the Ottawa research-and-development centre it took over from BlackBerry Ltd. in March. The provincial and federal governments are kicking in $204 million, and Ontario Infrastructure Minister Bob Chiarelli said that Ford has shown its commitment to Canada. “At this time, there is no impact on Ontario’s workers and plants due to the company’s new strategic direction,” he said in a statement to Automotive News Canada. The University of Windsor’s Faria, however, believes any security offered by the investments is short-term. Likewise, he said, Oakville could benefit from a new high-profile vehicle to build alongside the Edge and Lincoln MKX — recently renamed the Nautilus. Two other models assembled at Oakville, the Flex and MKT, are expected to be phased out. But Faria and Unifor Local 707 president Dave Thomas think Ford would be reluctant to face what could be a significant sales drop in Canada, a market in which it battles for the sales lead, if it closed its sole vehicle plant here. “If they were to ever not build vehicles in Canada I think the loss of that market share would be just astronomical, and I don’t think it’s a chance they’d be willing to take,” said Thomas, who represents 4,800 workers in Oakville. He concedes, however, that others believe any automaker today won’t hesitate to move to where it can make the most money. General Motors might have provided support to that theory when it reportedly threatened to shift all Chevrolet Equinox production to Mexico if striking employees in Ingersoll, Ont., didn’t drop demands that their plant be designated lead Equinox producer. The strike ended in October with no assurances about the plant’s future. Oakville’s union did win lead plant status in 2016 and now builds leftand righthand-drive Ford Edges for export to more than 100 countries. Preserving that designation will be a priority for the union in 2020 bargaining. In Ottawa, some 300 software and hardware engineers work in a building that still bears the BlackBerry corporate logo. They’re just blocks from the headquarters of BlackBerry’s QNX division, which took over from Microsoft as supplier of software for Ford’s Sync infotainment system. With a focus on research and development across in-vehicle modems, driver-assist features and autonomous vehicles, the office is equally well placed in Hackett’s connected-vehicles strategy. Smaller facilities in Oakville, Waterloo, Ont., Cary, N.C., and Sunrise, Fla., do related work. Barrie Kirk of the Canadian Automated Vehicles Centre of Excellence, an Ottawa-based consulting firm, believes the centre in the Canadian capital has a strong foundation for growth. “They acquired a lot of really good talent there,” he said.